At Wofford College we had several VT-50 DECScopes. When I first started working on the Wofford Witch re-creation and restoration project, I could not locate any VT50 terminals. However, I have located a number of VT-52 DECScopes, which look identical to the VT-50, but have 24 lines of display rather than 12. The VT52 also has upper and lower case characters. I have four working VT-52s. 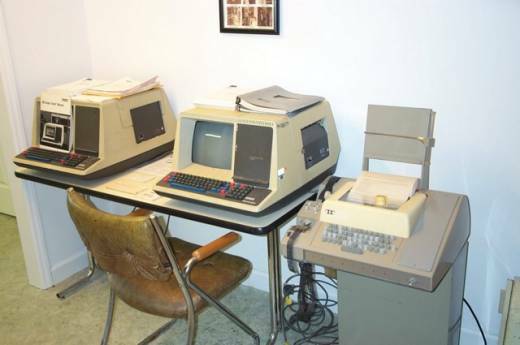 These two pictured are standard VT52 terminals with the EIA (RS232) adapters. Pictured above are two of my VT-52 DECScopes on the left. These VT-52 terminals are connected to my PDP-11/40 as part of the Wofford Witch environment.